Celebrity chef Jamie Oliver's restaurant, Jamies Italian, is located on the Southern Terrace at Westfield London. The man for whom superlatives are mere punctuation has opened up another of his very successful Italian eateries in Shepherds Bush, bringing a mockney slice of the Med to the Westfield. This is passing-custom heaven, attractively positioned between one of the Westfield’s main entrances and an escalator that handily pops people up right outside, like Jamie’s personal conveyor belt. They’re met with an attractive enough venue; a small alfresco area is brightened up by an authentic Italian ice cream van and a little bit of foliage, leading into an interior dressed in what can probably be described as modern-rustic chic. The predominance of wood, the wicker baskets and the tea-towel napkins make it feel traditionally trattoria, but it’s given a contemporary injection from brushed chrome, slate flooring, trendy chandelier lighting and of course, Jamie’s grin smiling out from all the cookbooks on sale. Jamie’s Italian is vibrant, loud and with a questionable taste in music, much like the cheeky chappie himself. It works though – the music is all guilty pleasures and the buzz of chattering diners makes everything feel nicely relaxed and informal. Staff know the menu inside out and are perfectly friendly, even if some could do with speaking up a little to counter the din. There’s a real mix of clientele in there too, with plenty of families, ladies lunching, couples, workers and even lone diners, all with one thing in common; they all seem to be enjoying themselves, which is nice. Using the template that has made the many other incarnations so popular across the UK, Jamie’s Italian concentrates once again on offering uncomplicated, traditional dishes that benefit most from the excellent quality of the ingredients. The carpaccio (£11.95), for example, features perfectly seasoned cured beef, fresh and peppery rocket, sweet roasted beetroot, fennel, parmesan and a perfectly balanced (and subtle) mix of horseradish, chilli, balsamic and olive oil. The pea bruschetta (£4.75) boasts similarly impressive ingredients, but the execution isn’t quite as good, with toast that tears and an uneven distribution of smashed peas, broad beans, buffalo ricotta, mint and lemon, which is a shame as when it’s as it should be the combination is delicious. Desserts are a return to form though, with an incredibly light and creamy panna cotta (£4.95) beautifully balanced by a sharp compote of red berries. Probably sitting safe in the knowledge that you can’t really go wrong with Italian wine, it’s a purely authentic wine list, with options starting with a perfectly reasonable, fruity house chardonnay available by the bottle (£15.35), by 500ml (£11.25) or by the glass (£4.35). If you do want to spend a little more you can, with plenty of options just over the £20 mark but nothing that’ll break the bank. Coffees (£1.95 for an Americano) are good, and certainly strong enough to keep any Italians happy, whilst you can also pick up bottled beers (Messina is £3.55, Castello £3.95), fresh juices (£2.55) and all the usual carbonated favourites. The Westfield is something of a mixed bag when it comes to eating but if you stick to Jamie’s Italian you’ll be in good hands. Tell your friends and feel free to say words like pukka and wicked. First time and terrible time. The waitress ( brunette with the glasses) was not considerate and polite, felt a racism. The other table with bunch of european customers were served differently. We were 5 of us (2 kids, 3 adults asians). While the waitress was passing through as many times without cleaning up our table even we already finished the mains and prepared the dirty plates to pick up( you could clearly see cos we were sitting on a near passing way. While jumping to a new customers while we have left out. The same with the desserts. Even though it was not busy. Also she gave a wrong dessert to one of us, changed without even apologising.! Need to hire professionals! I dont think its about the wage. Decided to try somewhere different for my birthday and with the name linked to the restaurant expected something great. Reality is wouldn't eat there again,over priced, under portioned and the best thing about it was the bread. Deffo wouldn't recommend, not even worth rating but as there is no zero's i'll give it one star. Not the best birthday and total waste of money sadly.Disappointed customer is an understatement!! We were looking forward to the Jaimie Oliver Italian experience today at Westfield. The waiter was excellent, the food ok but what really spoiled our lunch in this family restaurant was the overloud terrible music, it was far too loud and we were unable to hear each other talk, the choice of music was awful not what I want to hear in a family restaurant. Sorry but we will not be returning .I hope Jamie Oliver reads this and takes my comments on board. This is the first time I have reviewed a restaurant but I felt I had to after being really disappointed by this place. I visited on a quiet night with my boyfriend and we were seated quickly but a host that virtually sprinted us down to the far end of the restaurant in an effort to return to the front desk quickly. We were promtly served drinks by our waiter who then quickly ran off without taking our food order. We waited for about another 15 mins and then had to grab another waiter running past us to take our order. They had run out of the lamb stew, which we'd have appreciated being told from the start, so my boyfriend ordered the Turkey Milanese, which he enjoyed. I ordered the Sausage Papardelle without cheese but it came with cheese so I had to wait 10 mins for a replacement. It didn't matter anyway as the dish was inedible as it had such a strong garlic and fennel flavour, even the smell of it was making me feel ill. The pasta was also seriously dried out and chewy. The prices are above average for a chain Italian and in my mind the food really isn't worth the money. Ok I never write any reviews , but I had to write this with the service we got from Jamie's Italian at Westfield . After shopping with my wife and our daughter we went to this place to have dinner ! It's a shock ! Service is terrible ! The waiters don't know where to serve he food , had to wait 10 minutes before the drinks order . Starters came without any plates ? My main was cold !! What a joke ! Seriously if you think o going to this place , please save your money spend somewhere else. Jamie , mmmm better stick to your TV career !!! Out of all the lovely restaurants that were around we chose Jamie Oliver restaurant for a new experience. What a mistake! The food tastes like...err...nothing! The food is clearly frozen food and not even quality frozen food, I used to shop in Iceland and I can honestly say the food is better! I was unable to finish my meal it was that bad! and I left feeling hungry and ripped off! Like the other review said, I would rather have a kebab or go to Mcdonalds! Don't waste your time here, check out the other restaurants that are around anything will be better than the food here! Shame on Jamie Oliver! This place is a culinary nightmare!! !I normally don't write reviews about restaurants, but for this one I just had to since I just visited the place tonight and to say I am shocked is a true understatment.First of all, they got our order wrong and when we corrected them they brought the food to us very cold. To put it simple terms, the service was laughable.As for the food, I can honestly say, the food I had on Georgian Airlines had more taste than Jamie's Italian...and I do not know what was Italian about it. The black truffle risotto had only a tiny piece of black truffle and the risotto resembled porridge left over from two weeks ago. The veal was like the meat they can give you in the worst airline and it was on a bed of white tasteless goo.Do not waste your time or money and never ever go there. I'm not the best cook in the world, but I am sure I am much better than Jamie Oliver if he's so confident about his own restaurant. What a shame Jamie...I'd rather have a greasy kebab dipped in vomit than eat at your restaurant. Never again! took my girlfriend here after shopping, great location. Basically though, a very average Italian. Friendly staff, nice environment but average food, prices above average ! My girlfriend liked that you can order smaller portions of the mains but the food wasn't anything special. We ate at Jamie's Italian restaurant in Westfields yesterday (sunday). We're giving our rating two stars because the service was friendly and helpful but the food really only gets one star. There were three of us and we ordered the house white, a decent tasting Italian organic Chardonnay, and three main courses ('large' sizes - more on that later). We had the Truffle Risotto which was, at best, ordinary. The flavour was okay, nothing to write home about and the dish was just a bowl of risotto - nothing else. The second dish was the Buffalo Ricotta Ravioli which was dried out (undercooked / extended time under heat lamp? - yes, we do know the difference between 'dried out' and el dente pasta). Paradoxically, whilst the pasta was dried out, it was sitting in a puddle of water. The filling was bland and lacking in any creative flavour. Both of these first two dishes were the 'large' size however they were small portions (in our collective opinion). The third dish was the Lamb Speidini which came different to what we expected as described in the menu. First, the lamb came on a skewer with bay leaves and cubed pollenta. There were two very small pieces of meat, one of shoulder and one of leg and the other bigger pieces of meat were one each of heart, liver, and kidney. The skewer of meat was served (unexpectedly) on a bed of cold, semi-crushed baby potatoes with a bland, lemony/creme fraiche sauce. This dish was a real disappointment (we all tried each other's dishes out of morbid curiosity). Please think about spending your money and time elsewhere and please note we are fans of jo (or, at least we used to be). *** Jamie *** - are you reading your restaurants' reviews? Folks are paying pretty good money for low quality, uninspiring food with your name and reputation all over it. You can't make up for poor food with super friendly staff and good service. We tried Jamies Italian a couple of days ago, first impressions; superb - We had to wait 20 minutes for a table, no problem at all, so we brought a drink each at the bar. Staff were friendly up until this point. Our buzzer went off and we started making our way to the table. We were seated next to a table where the kids sitting there were banging our table, running around it, screaming and treating the seats as climbing frames so we decides to leave as this was being ignored by the staff (hardly a relaxing meal). On the way out the waiter grabbed me from behind by the shoulder, literally turning me around and accused me of stealing because I did not pay for the drinks (I paid for them while I was waiting for the table) I would never return to this restaurant, or try any other of Jamies restaurants. This is the worst restaurant I have ever experienced in my life so far. my parents and i had been shopping at westfield and were looking for somewhere for dinner. we walked all along the strip of restaurants and the last one we came to was jamie's italian. the placed looked fantastic and we were all agreed that it was the most appealing of the bunch. great atmosphere and very friendly wait staff. the food was just divine. the highlight was the scallop and squid ink angel hair, which was the best pasta dish i have tasted outside of italy! the crispy polenta chips were also very good, but we were all very happy with our meals. the service was fantastic, again the best i've seen in london in a long time. all in all we had a thoroughly enjoyable evening and i will definitely be returning there soon. We went with my husband and mother in law and the food is just plain disappointing I am a fan of Jamie's (or was) and was absolutely shocked by the quality of the food. Its as if the cooks have never been to a good Italian restaurant let alone Italy. It was cringingly bad food We ordered penne arrabiata, rabbit ravioli and prawn linguini. Everything was bland. The arrabiata was undercooked pasta with chili oil and some canned tomato sauce!! Horrendous- would never go again! I was quite exited to go to Jamie's Italian restaurant and my expectations were quite high. However, the experience was very disappointing. We had to wait for 40 minutes for a table and therefore I order a starter (arancini). The taste was a bit bland and the tomato sauce that come with them was quite chilly. As first dish I had taglietelle with truffles. They were just ok but the taste of butter was stronger than the taste of the truffles. As second dish I was looking for something quite Italian traditional and not too spicy but in most of the dishes there was chilly. Finally I went for the fish dish. The dish of the day was coley which is cheaper than other type of fishes e.g. like cod. However, the price of this dish was one of the most expensive in the menu. When the fished arrived, the taste was very bland and it was served with a very chilly tomato sauce and couscous all wrapped into a foiled paper and baked. I really didn't like the combination of couscous with this fish and the sauce was so chilly that you couldn't distinguish any other flavour. As a dessert I had the chocolate dessert with vanilla ice cream which was ok. Regarding the service, the staff is quite friendly but a bit slow and they have been definitely trained to oversell the dishes, behavior that might be acceptable for a very good quality meal but that I found annoying after the meal that I had. There are so many Italian restaurant in London much better than this one and less pretentious. I won't go to this restaurant again. It's not worth it. I have just returned from a visit to Jamie's restaurant at Westfields. I went with my mother, my husband and my four children. We were all disappointed with the quality of the food. My mother ordered the crab bruschetta, there was too much sauce and very little crab. She also ordered the pappadrelle and meatballs which was dry and very bland. I ordered the fried fish. I accept that I shouldn't order fish on a Sunday as the fish cannot be fresh (the fish would have been bought on Saturday at the earliest) however this fish tasted old. The batter around the fish was limp and not crispy. The menu was also misleading as I didn't expect an assortment of fish. I had white fish pieces, squid, (very rubbery) and whitebait?? I also had a very tough old prawn. The garlicky chips were also limp and not at all crispy. My husband had the special, belly pork with lentils. It was bland and there was no crispy skin. My 2 youngest children had the childrens menu. One had spaghetti bolognese, which he usually loves, it arrived looking very dry and crispy around the edges. He did not finish it. My daughter had the cheese and tomato ravioli, again it was bland and arrived cold. My main complaint is that all the food arrived lukewarm at best, all of it was very bland and all of it was very disappointing. Jamie Oliver is such a fan of Italian food you would think he would know that pasta needs to be served hot and made fresh. All the dishes were reheated and had been sitting under a hot lamp, the pasta was not good, it was chewy and crispy at the edges and was very dry. The chips were soft and limp, not nice, the fish was soft and old tasting and belly pork should have crispy skin, there's not much meat on it after all. And all of the food needed seasoning. When the kids had the ice cream for dessert, it wasn't much better than the mains. All the food was very disappointing and I am afraid to say I will not be going back. On a plus note, our waitress was very nice. When visiting one of Jamie's restaurants one must bear in mind that this is the man who sets himself up as the authority on the nation's school meals. 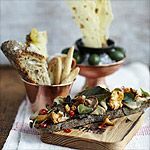 I have been twice to Jamie's Italian in Westfield; the second visit was with my family and grandson as the location is fine and we wanted to visit Westfield. The first time I had the thin steak; it was heavy on the herbs and I was disappointed. However the service was pleasant and the staff friendly. Yesterday was for lunch. The courgettes fritters weare meagre and salty and, quite frankly, the chickpea sauce was too bland to work. My grandson had the crispy squid and, at 9, is an expert. His view was that Carlucciois was much better. My funky chips were pallid and limp; when I pointed this out to the waiter he apologised but did not offer a replacement. I won't go through the rest of the meal in detail except to say that the 4 of us left feeling a trifle dispirited and very disappointed. Westfield has many restaurants and I would suggest trying somewhere else if you are looking for quality food.